Our staff can replace missing teeth with our dental implants, giving you natural-looking results. Our dedicated team provides complete orthodontic care for children and adults. Want that movie star smile? We can place veneers to give you that million dollar smile. See what we can do to brighten and whiten your smile. Call (717) 526-2011 for 24/7 emergency dental services! At American Dental Care, your local family dentistry practice in Harrisburg, we provide the highest standards of patient care to restore and enhance the natural beauty of your smile. We offer personalized and painless restorative, cosmetic, and emergency dental care services for our patients. Going to the dentist doesn’t have to be unpleasant, and with our staff and doctors, it isn’t! You will feel right at home during each visit. We pride ourselves on giving every patient a positive, comfortable, and relaxing experience at our local dentist office. 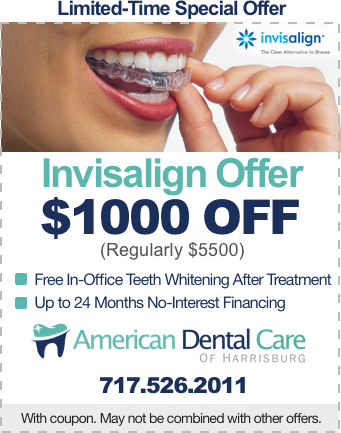 There are many Harrisburg dentists, but there is only one American Dental Care. Our practice serves patients from Harrisburg, New Cumberland, Bressler, PA, and the surrounding area. Call us today to set up an appointment and learn why our patients refer their friends and family to us. Our practice provides a wide range of advanced treatments and procedures in general dentistry, endodontics, periodontics, orthodontics, oral surgery, and implant services. We can help you create and maintain the beautiful, healthy smile you’ve always wanted! Out-of-pocket costs can sometimes prevent you from getting the care that you need. 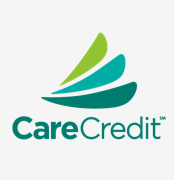 Fortunately, CareCredit offers affordable, low-interest financial help. Apply online today, and take the first step toward a healthier, more beautiful smile. 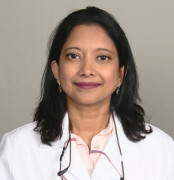 Our Practice Offers Numerous Specialties, All In One Office! Dental Implants – These are a natural-looking, permanent solution to missing teeth. A metal post or frame is surgically positioned beneath your gums and into the jawbone. Once in place, the dental implant allows your dentist to mount replacement teeth or to attach dentures that can be snapped in and out for a secure fit and easy cleaning. This procedure can improve the quality of your smile and your life! Endodontics (Root Canal Therapy) – Our teeth are meant to last a lifetime. Sometimes, however, damage occurs to a tooth (often from a deep cavity or an injury that causes a tooth to crack), and the inside of the tooth becomes infected. A root canal may be performed to preserve a tooth or to stop or prevent infection. Periodontics (Gum Treatment) – Healthy gums are critical to maintaining healthy teeth and avoiding bone loss. A periodontist is a dentist who specializes in the prevention, diagnosis, and treatment of periodontal disease, as well as the placement of dental implants. Periodontists are also experts in treating oral inflammation. Our dentist can determine your gum health and whether any corrective measures are necessary during a regular exam. Invisalign (Invisible Braces) – Invisalign® straightens your teeth using a custom-made series of aligners created just for you. These aligner trays are made of smooth, comfortable, and virtually invisible plastic that you wear over your teeth. They gently and gradually shift your teeth into place. Invisalign® is convenient and less noticeable than regular braces. Oral Surgery – We have an oral surgeon on staff to handle any dental surgeries, such as wisdom teeth extractions. This form of dentistry treats diseases, injuries, and defects around the head, neck, face, and jaw. Composite Fillings – Tooth-colored fillings, also called white fillings, restore and mimic the natural appearance of tooth structure. We offer these to match the natural look and color of your teeth. This procedure can be done in just one appointment! Crowns and Bridges – We offer all types of restorative dentistry including porcelain crowns and bridges. These prosthetic devices will restore your full and beautiful smile. Caps flawlessly cover up damaged teeth, while bridges will replace one or more missing teeth. Dentures / Partials – We offer affordable full and partial dentures that create natural-looking teeth. The experts at American Dental Care of Harrisburg can discuss what options will best fit your specific needs. Teeth Cleaning – Regular appointments will help to keep your mouth clean and disease-free. During a routine cleaning, our friendly staff will remove built-up plaque and tartar, prevent gum disease, and ensure that all of your teeth remain healthy. We’ll also talk to you about how you can take care of your smile. Our office is conveniently located on 4811 Jonestown Rd, Suite 129, Harrisburg, PA 17109. When you schedule an “appointment”, we are reserving that just for you. Our staff and doctors are waiting for you at your scheduled time. If you must change your appointment, please inform us at least 48 hours in advance so that we may adjust our schedule to accommodate other patients. We know many people find going to the dentist stressful. That is why our slogan is “We cater to cowards”. Were a small town dentist with small town values that utilizes the state-of-the-art in advanced dentistry. We treat each patient the way we would want to be treated, just like family. We provide our patients affordable plans and payment options because we believe everyone should be able to get quality dental work.